We are trying out new ways of expressing ourselves in Creative Drawing class. We drew a horizon line on our paper and placed either one dot (one point perspective) or two dots (two point perspective). From that point, we took a ruler and drew angled lines through those points. The above drawings are examples of the beginning of this exercise with two point perspective. The next step was to begin incorporating vertical lines until we began to see the possibility of a drawing we’d like to create. This we did completely through our own design, allowing some creativity to insert itself into the drawing. This exercise helped to remind me to pay attention to the angle of things, whether I’m looking down at something or up. It was great practice on bringing in other elements to creating than actually looking at something. 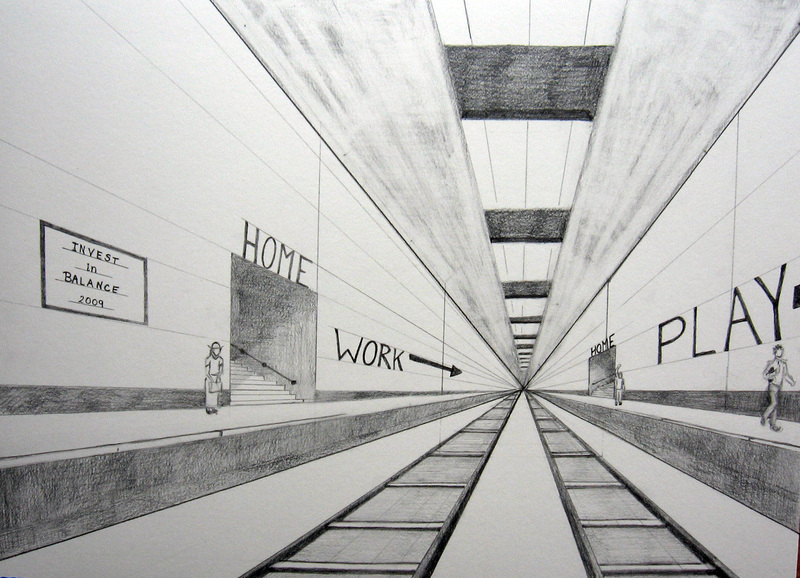 Below is a one point perspective drawing, carried furthur. The assignment for this session was to grid a photo.We next chose any format, vertical, square, horizontal and fit the same number lines as in the photo reference on our paper, but with a twist. We angled these lines in different directions.We had to be careful not to cross vertical gridlines over vertical grid lines or horizontal grid lines over horizontal grid lines. This is to insure that we have the same number of gridded spaces to fill in on our distorted grid as we have in the photo reference. The above step shows the grid lines drawn all helter skelter and the beginning of the drawing penciled in. We had to start making decisions about what to do with distorted spaces to get the information in to the new space in some manner. This meant that we may have to follow the path of a grid line, enlarge a portion grotesquely, or squash a lot of information into a tiny space. 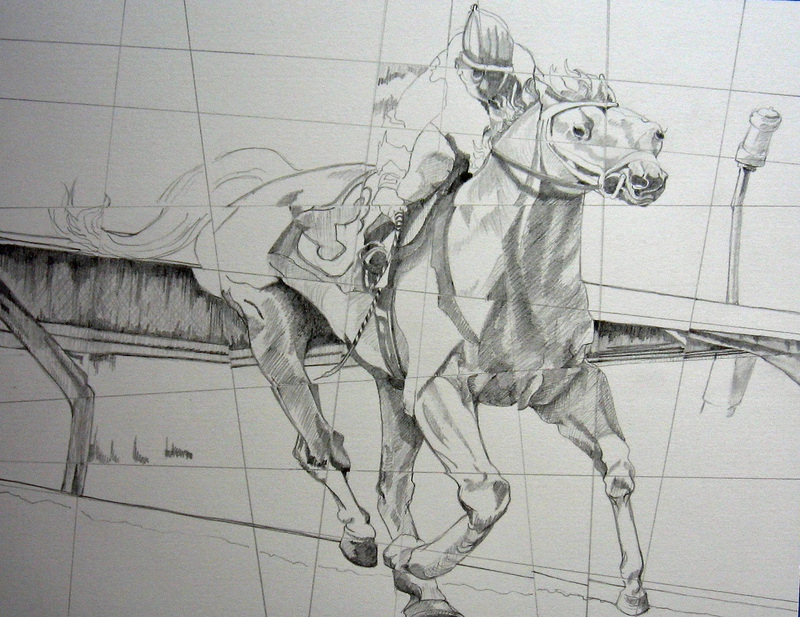 Note the difference in the proportion of the legs, both sides of the head as well as the nose, the elongated head of the jockey, the narrowed rear of the horse, the distorted railing and on and on. We then played around with shading some darks in to watch the distortion begin to take place. We needed to make furthur decisions as to whether to connect lines on our drawings that didn’t meet. I allowed the shading in mine to define those broken spaces. The final step was filling in the values and erasing the grid lines if we want to. This was an excellent exercise to enhance concentration on what lines and values were there and making decisions as to how to enhance the finished distortion. It also offered that wonderful feeling of wonder, ” what kind of distortion are we going to get?”. It was like taking an old and boring drawing practice and funking it up to put a new vision out there. I felt I got more movement in the horse with the distortion, foreshortening was exaggerated, and the horse became more streamlined. The twist to the fence and the pole in the background gave a furthur impression of movement . This week we concentrated on cross contour drawing. We were told to pick up and actually feel the surface of an apple that we were given. We noticed that it was rounded and bumped along on the surface. We set our apple down and, while looking at it, drew lines across our paper as though we were feeling the inside surface horizontally and vertically. 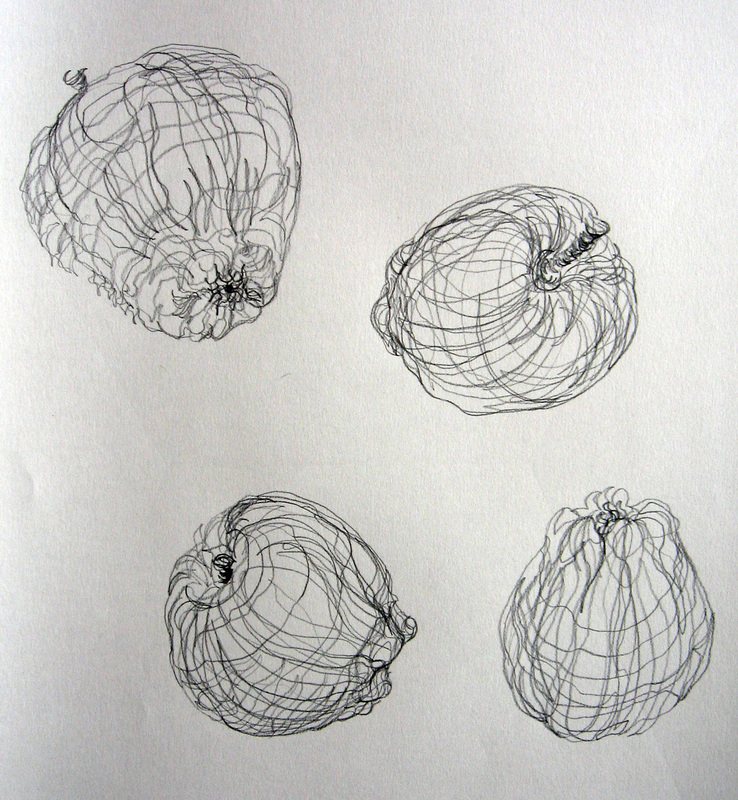 The more lines we transposed, the more our apple began to take shape. Any outer edges had to come from the continuation of a cross contour line. 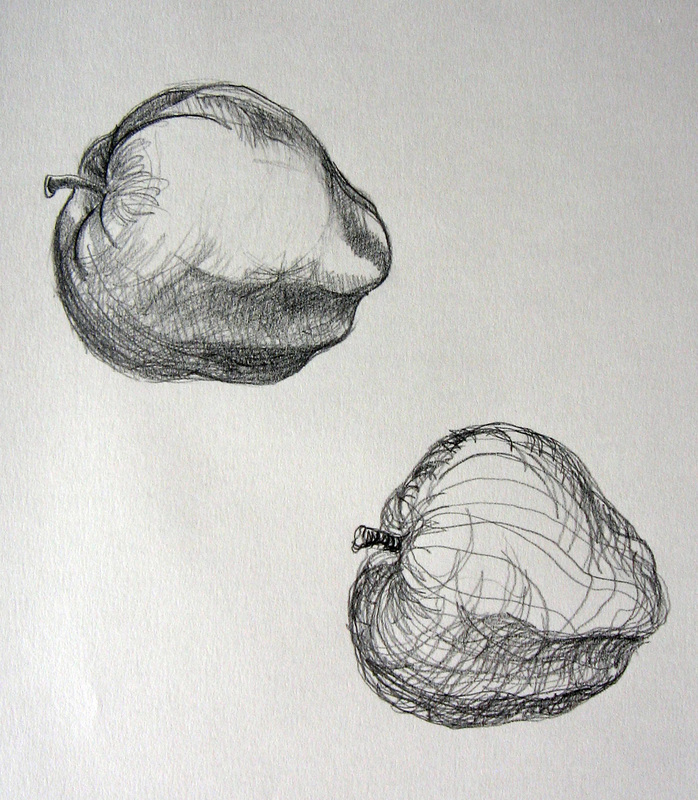 We found that form began to develop as we drew and the apple began to have a bulky full look to its’ shape. Below is an example of an apple drawn this way in four positions. Note that even the stem was rendered with cross contour lines. It was furthur explained that if we continued to fill in lines in the darker areas that we could render the darker values of our object and that it would have a heftier and more shaped appearance than if we were to use an outer contour with value rendered with crosshatching. The apple in the upper left hand corner was an apple that was drawn relying heavily on outside contour and shaded with crosshatching. There was a quick stroke of circular contour marks toward the top indicating its’ roundness. The apple in the lower right hand corner was rendered using only cross contours with the artist applying more pressure and more cross contours where the apple appeared darker. Neither rendering need to be considered as better than the other. 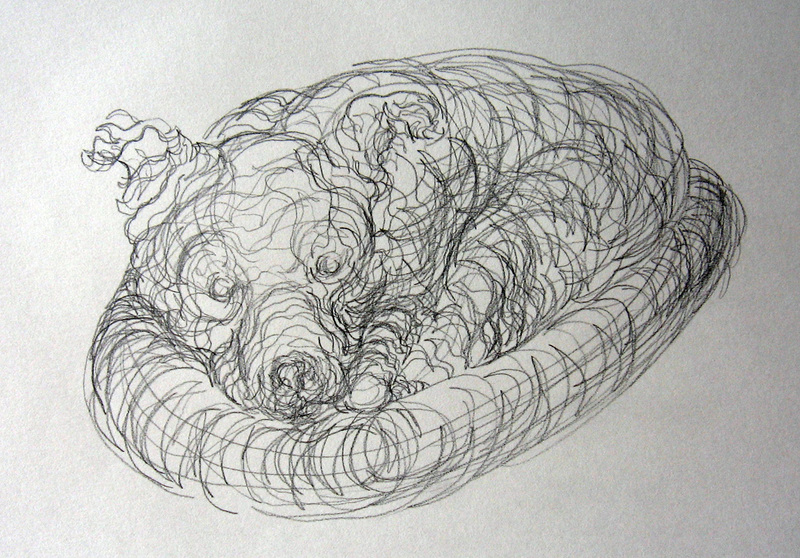 If the artist wishes to describe the form of the surface or give his image some heft and substance, cross contour can be a very useful skill to develop. 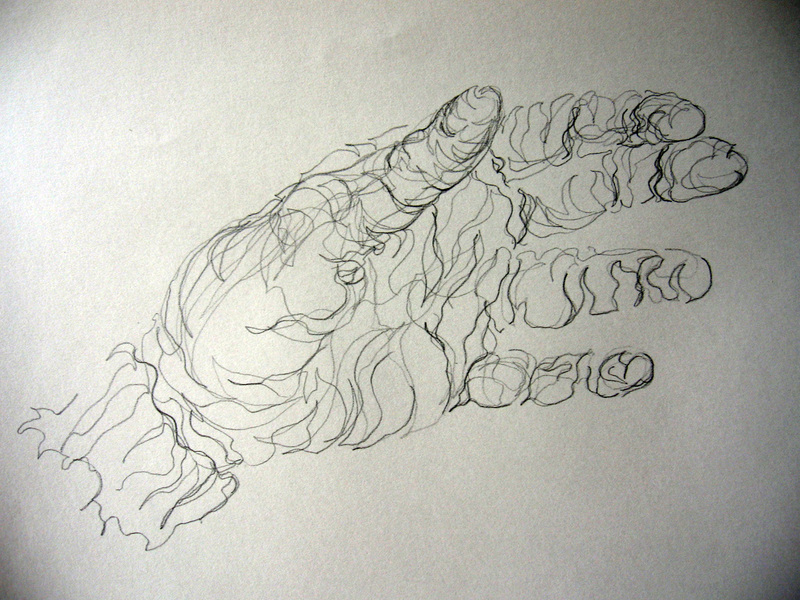 We drew our hands in cross contour, next.We were told not to worry about any distortion that may appear and to press harder on a contour where we saw a more distinct dark line or area. We were instructed to move our pencils in and out and around the hand without describing the outer contour line, first, but allow it to form as a part of a cross contour. It was explained that anything can be drawn in cross contour. Even the family pet. The last thing we did was to describe clouds with the use of cross contour. 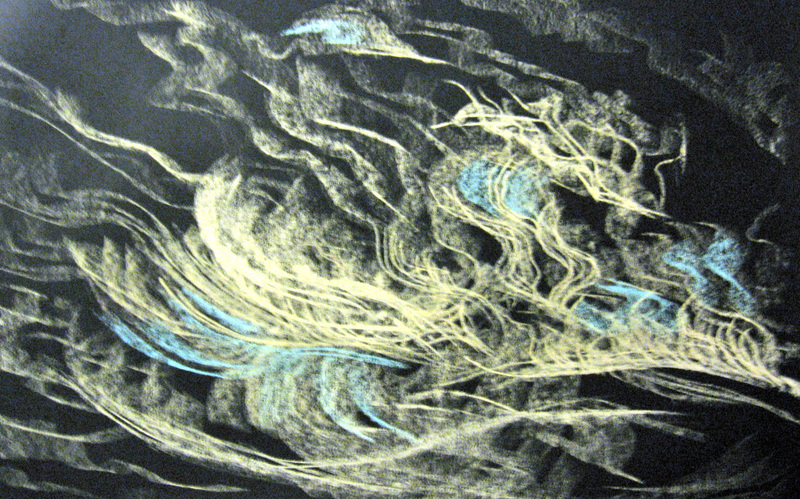 For this we tried using yellow and turqouise pastel sticks. We were told we could break them and use the side, edge and end of the stick. We were to apply heavier pressure where we felt it was needed to feel the surface and lighter pressure where we felt the clouds called for it.We were instructed to not go back and forth in a shading motion, but to feel the surface of the cloud and the direction of its’ movement. 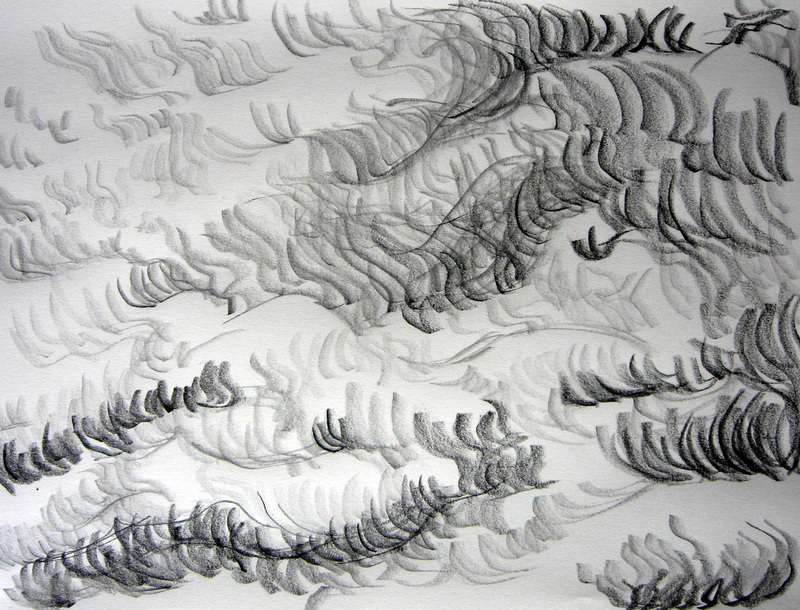 We also tried rendering cross contour clouds with graphite pencils using the side of the led as well as the point. We discussed Van Gogh’s skies like in “Starry Night” and recalled some of his other paintings wondering if he incorporated cross contour into his skies. We decided to look for evidence of the use in other drawings and paintings we came across in the future. We concluded that cross contour, added to our drawings and paintings, could help to provide shape, volume and movement where it may be needed. 1. 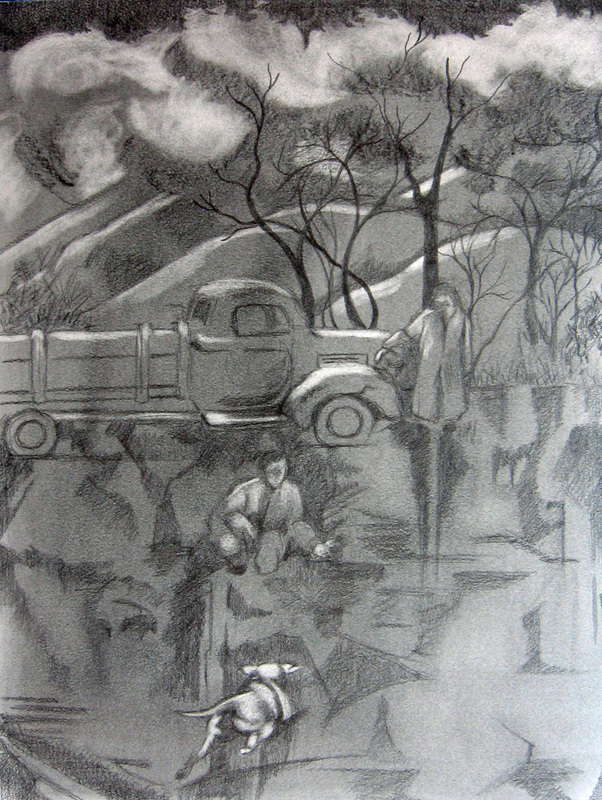 Create low key drawing by toning paper with powdered graphite rubbed in with a tissue, first. 2. Pop the important elements by making them lighter and surrounding them with deeper darks. 3. Simplify figures and elements so they would stand out and not appear redundant to furthur enhance the dreamlike quality and story line. We learned that the values of an exercise like this could help us create something new from our own experiences. We learned to approach the creation of a drawing by spending some time planning it , first. We eliminated the confusing step of “how do I render this out of my head?” by creating a photo reference to help guide us in our endeavors. Another step we could have included might have been a quick sketch or thumbnail to design our darks and lights. All in all this exercise was probably the most creative venture I, personally, have ever undertaken. This week we took a photo that interested us and divided it into numerous equal segments. The picture could be divided in any number of divisions but the measurements of the parts were to be equal.I then cut out all the pieces that I had marked off and began playing with different combinations of the parts until I saw an arrangement that I may be able to create a readable drawing from. We were told we could use any combination of parts. We could also just quarter our photo and rearrange the four quarters if we thought we could get a more readable final result. What we learned in this step is that we may have to turn segments upside down in order for them to be workable. We may even have to eliminate pieces in order for the final product to say what we want. We were instructed that we could not take parts of other pictures to include in this one. Our challenge came from what we could solve with limited information. The following images were my steps to creating a drawing from my reference. 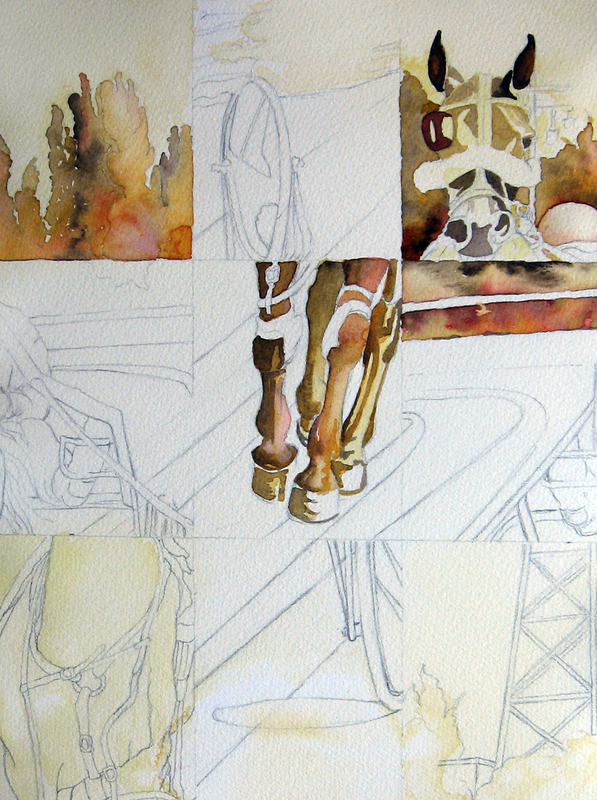 I chose three watercolor colors for this project. They were quinachridone gold, brown madder and sepia. I measured off my format and drew the images for each section and began by working in the darkest portions of the picture. After completing the darks, I noticed that there was going to be too much disharmony to the piece so I began to concentrate on the grooves in the track and decided that those strips needed to be developed in order to bring all the parts together. 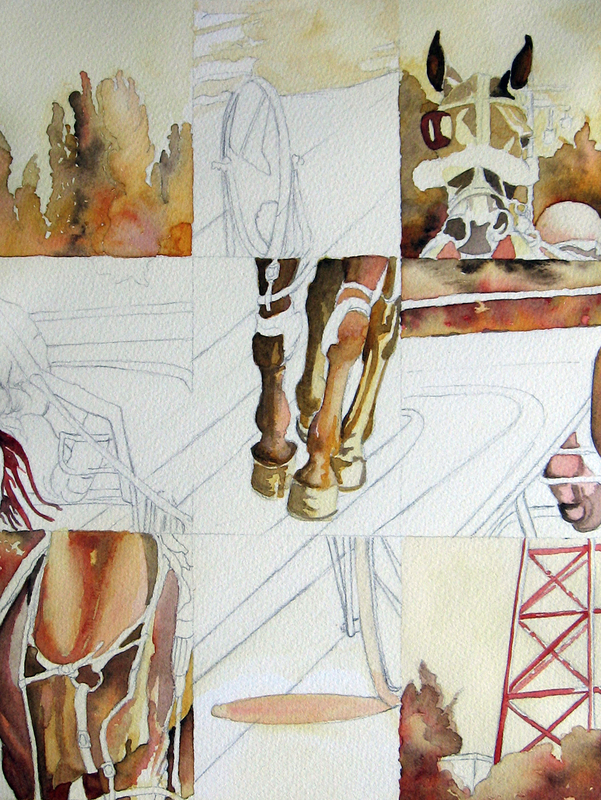 I also noticed that I’d have to darken the shadows top and bottom next to the wheels of the sulky so the viewer’s eye would not slip up or down off the composition. I was finally satisfied with what I was creating and balanced top and bottom and both sides by completing the values very similar to each other so that the major elements of the horse demanded attention. 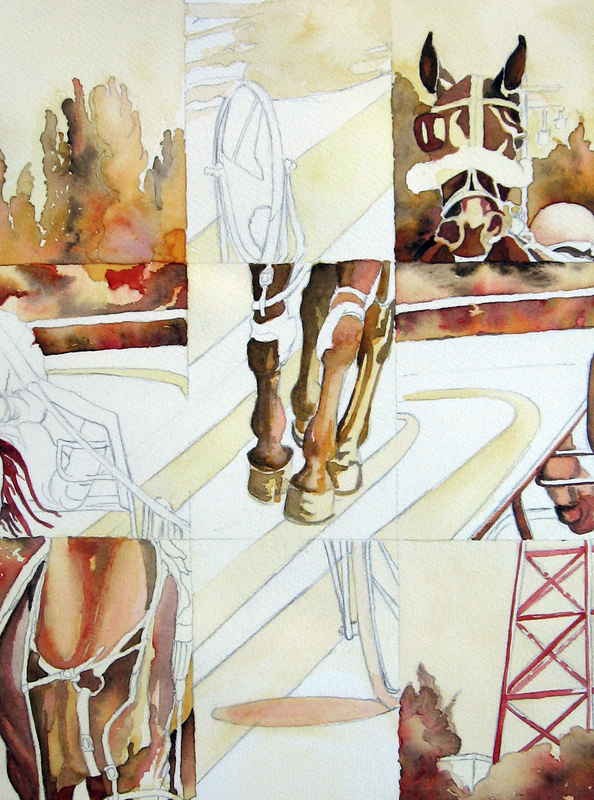 I liked how the track lines unified the piece and darkened them to create a path for the viewer’s eye. We learned that we had to pay special attention to the values of our created reference and that we may have to rely on subtle suggestions within the reference and use our knowledge of space line and value to bring the piece together. It strengthened our ability to problem solve and demanded that we use that thing called artistic license to pull it off. I, personally, found this exercise more difficult than creating the reference collage for week four because we were limited to one picture and couldn’t go running for another to solve our composition problems. I also learned there were other compositions nestled within one photo. This week, in creative drawing class, we used low tack painters tape to draw our images or design on paper. We used vellum bristol board for this as it seems to stand up to having tape removed from it with minimal damage to the surface. 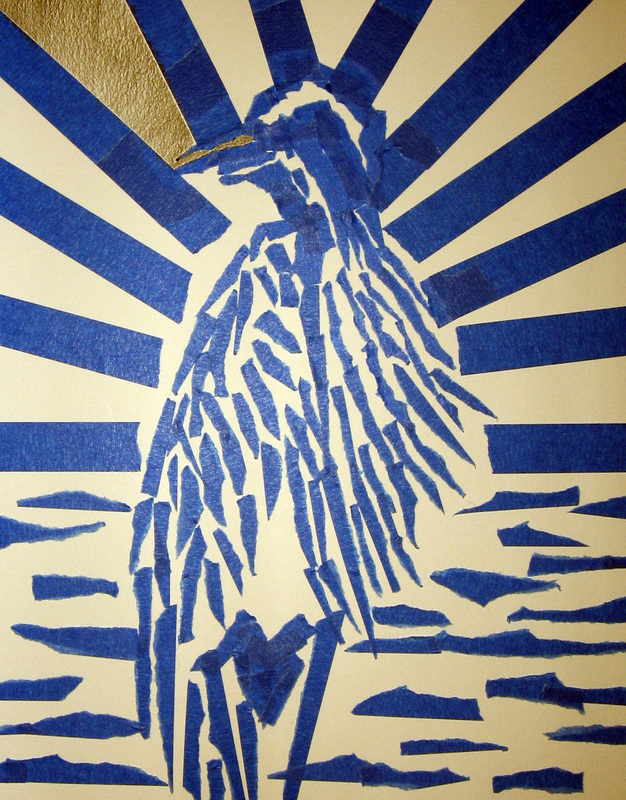 In the first step we tore or cut our tape and used it to design or create an image on our paper. We were told these areas would be reserved whites for furthur creation later. 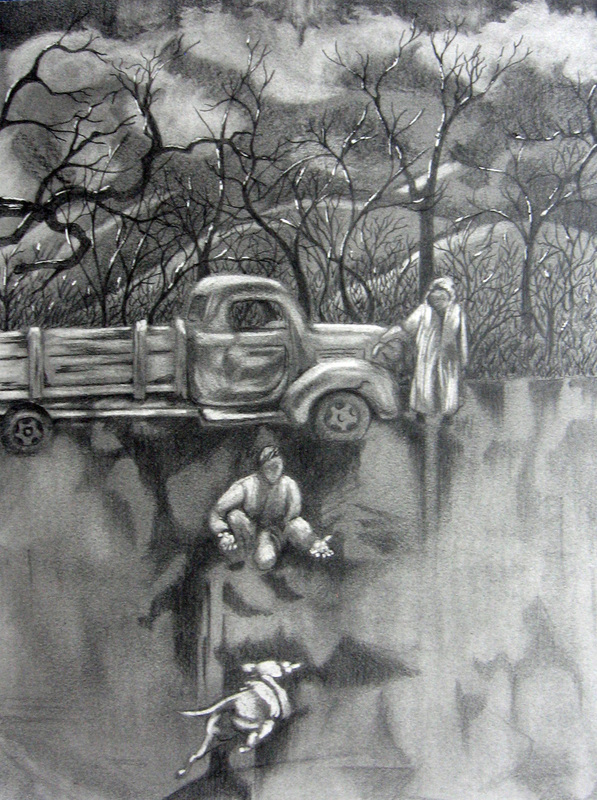 We then worked graphite into the exposed areas. I used a B and 6B pencil on this step. 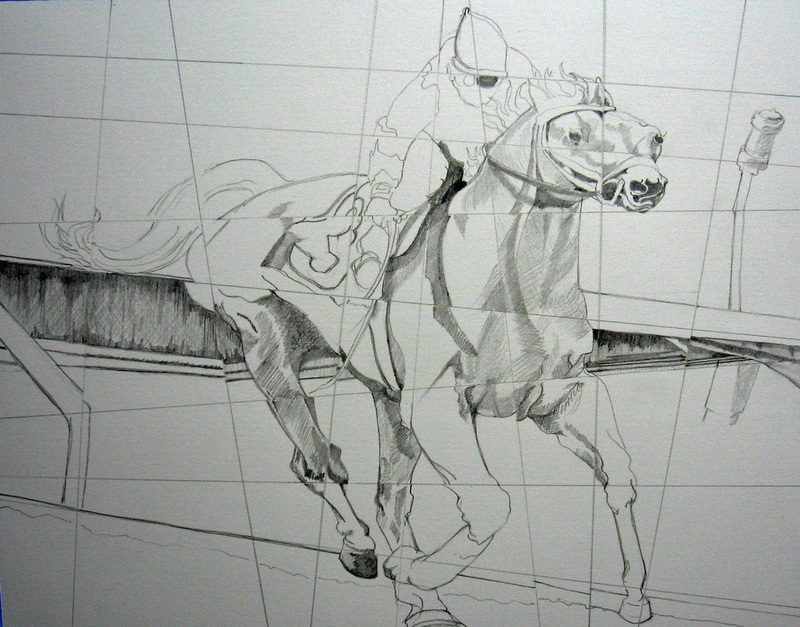 In step three we continued shading in the exposed areas until we had all areas defined. My darkest areas were about 5 layers of graphite. The midtones were only one or two layers of graphite. In the final phase, we removed the tape carefully and furthur shaded our drawing. 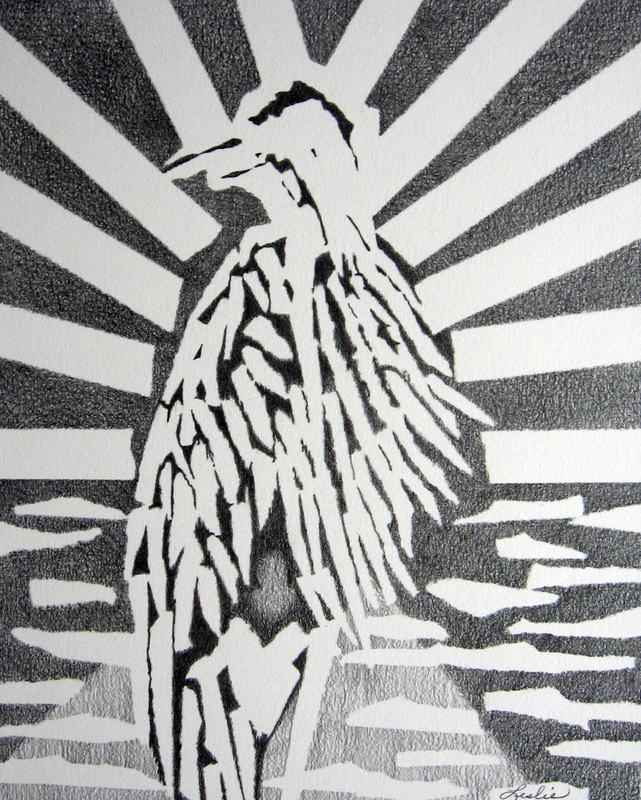 I chose not to shade into the whites in the final phase but did darken around the heron’s head and shoulders and under his tail . 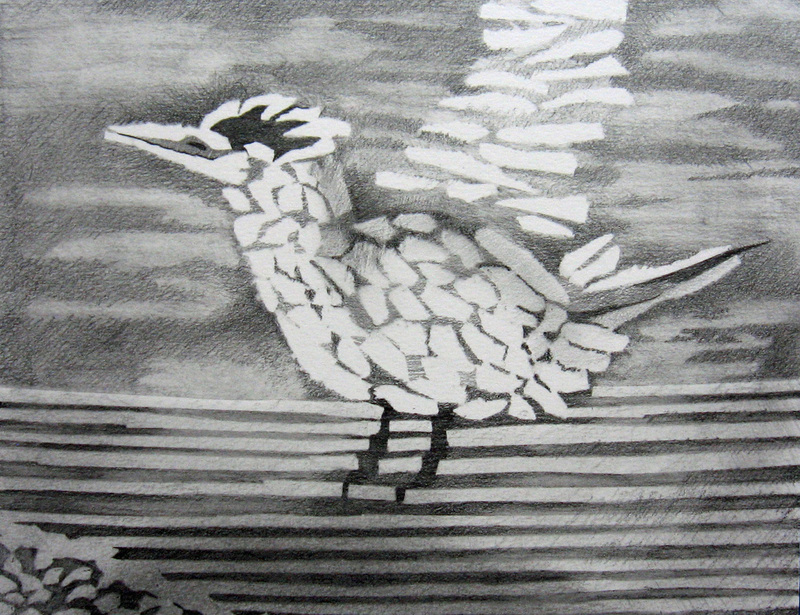 We discussed that the drawing could be furthur shaded as I did with the tern, above. In this drawing I rubbed, shaded, and lifted with a gum eraser all after I had removed the tape. 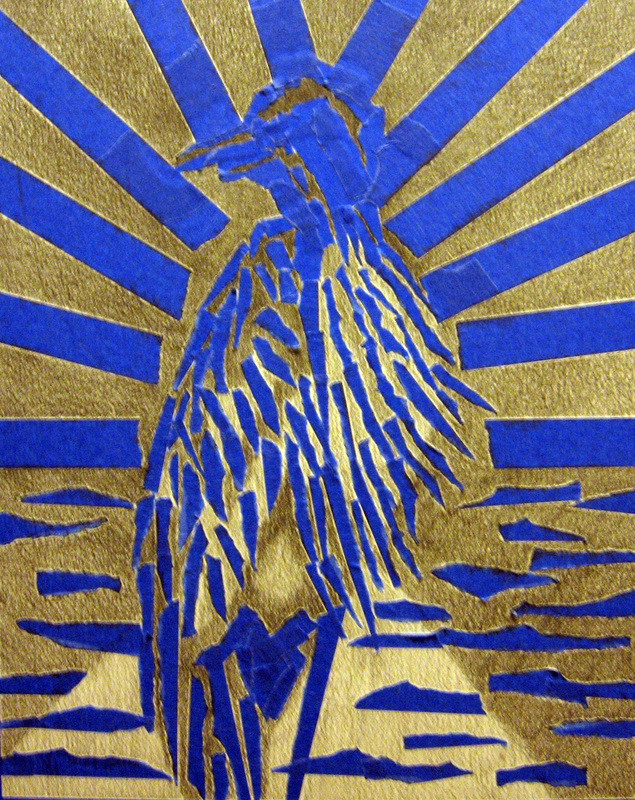 We decided that this exercise was a good study for design, using values and as a lead up skill to collage. It required that we put down our drawing implements and work with another media. I, for one, would like to explore this technique furthur. Oh wow, what a great exercise! Beautiful results, too!! These are staggeringly interesting to me Leslie and you’ve explained everything so clearly. Being such an ignoramus when it comes to anything like perspective or grids, this has really opened my eyes. Naturally, the drawings are all beautifully drawn by you. You’re so generous with your knowledge – thank you again. Thanks, June. Keep checking back because I hope to post four more exercises before the class is over. I thought this might be helpful for artists to expand their creativity. I like especially ‘pastel clouds’ and the cross contour hand. the first has such a ghostly movement to it. Thanks Otto. As I was rendering this as an example I couldn’t stop wondering if this was how Van Gogh felt when he rendered his skies. It was like taking something wispy and giving it weight and life. This is very cool. There are some really open-ended ideas there. Very creative and challenging. Like that thinking a lot. Thank-you Antsketch. I think all of us in class are feeling the creative push from these exercises.It is very liberating. This concept is totally new to me. Thanks for introducing it to me.Are you gonna keep the parts together or seperate? Hi Raji.I assume you mean that photo reference of the horse where I have it divided into three segments like a triptych. I think I want to paint it as I layed it out with the legs pacing in the center. I am studying these lessons with great interest. I have several boxes of pictures that my dad took while in France/Germany during WW2 that I plan to use as reference material…these exercises are sparking many ideas now! Thanks! Your welcome Jim. All but the tape resist exercise came from suggestions in the book “Experimental Drawing” by Robert Kaupelis. It was recently re-released and chock full of drawing ideas for finished compositions with a creative bent. I like them because many of them get us thinking out of the box. There are several lessons here that you could carry quite far into explorations. Thanks for sharing them. I’ll come back for some reference and maybe spur myself on when I get to an imaginative dry spell. Thank-you, Kay. I love comments like this. I always hope that some of what I post is useful information for others in their own explorations. This was a course I taught in creative drawing where we explored different ways to challenge ourselves creatively. They were some pretty fun exercises that got us thinking outside the box. You do that all the time with your cartooning. You have no lack of creativity the way I see it. Thanks for taking the time to read through these! Leslie, this is interesting and helpful. Thank you! Thank you, Pen. 🙂 You have just made my day! Some time in the fall of 2009. I rendered it for my students to help them understand how to use perspective and the element of depth. Hi Leslie. I’m a few years late with these comments! but the jockey and horse picture has really caught my eye. 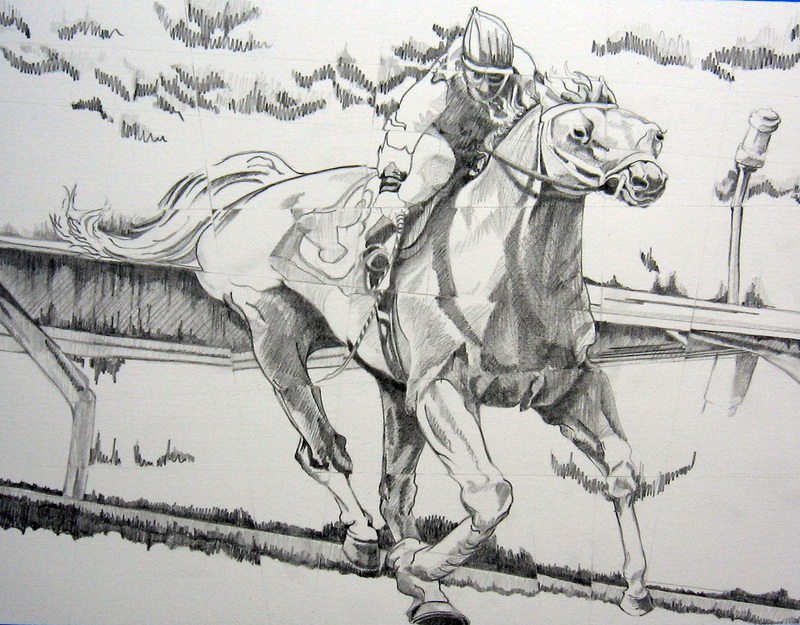 It is so strong capturing the power, sweat and speed of the horse and also the head wind. I can hear the hooves pounding on the track. I love the cloud contour drawings too. Thank you for posting the pics and the methods behind them, very interesting and it shows how different techniques can throw up surprising results! I must try a landscape with contour strokes. I’ve left this page up just in case anyone wants to try any of these exercises. 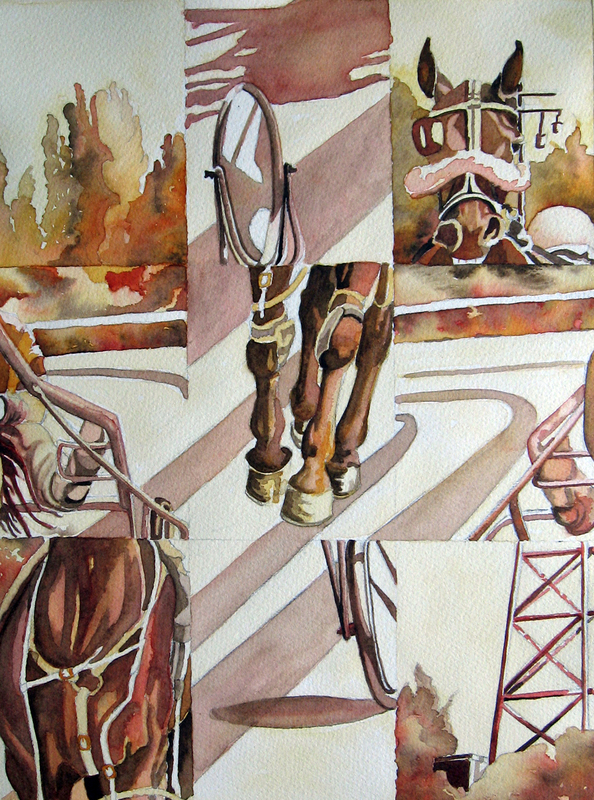 Thank you for the comment on the racehorse one! Very fascinating, Leslie. I don’t understand it all, but I appreciate your talent. Amazing! I like the grid transform process. I used it to blow up interesting parts and reduce less interesting parts by opening and closing down lines as required. You can even change the direction of grid lines part way across, but it can become quite mind numbing. It certainly opens a rich vein of possibilities. I need to spend some more time with this. 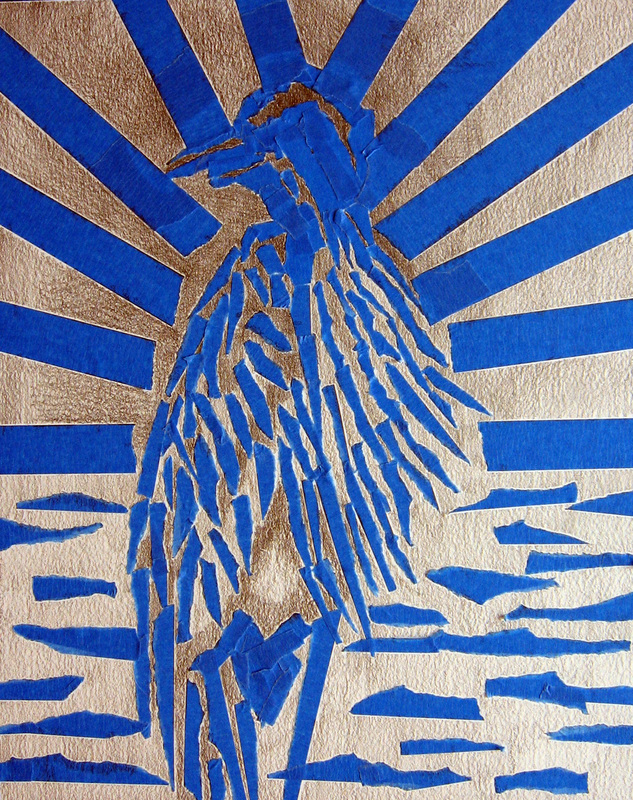 My students came up with so many interesting finished works in creative drawing class when we did this. I like your idea about changing direction of the lines part way across. So creative! Thank you! Wonderful – but I can’t take it all in at once! Oh, I know! 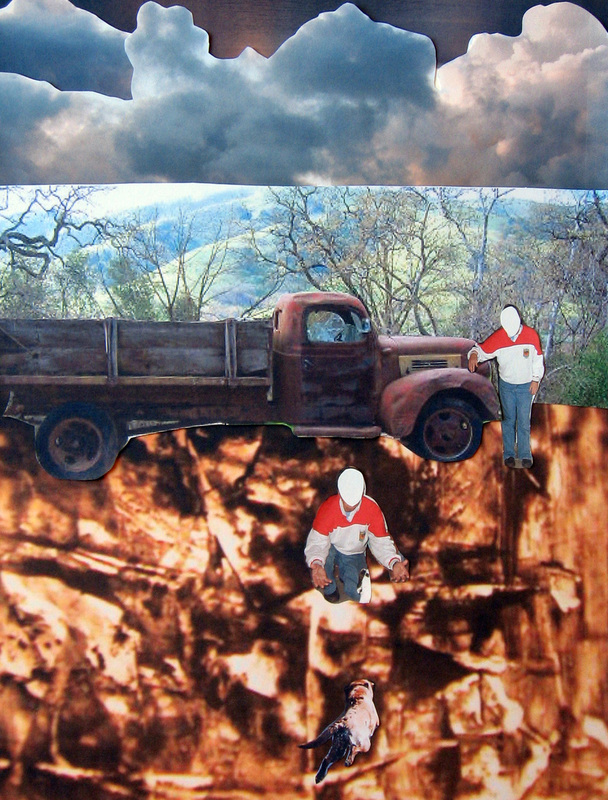 My favorite one was illustrating the dream. That could be done so many ways. I really want to work out another one some day. Just have not gotten back to playing around with some of these activities. Thank you for the comment! Great exercises! I will try some of these. Thanks for the clear notes and visuals!